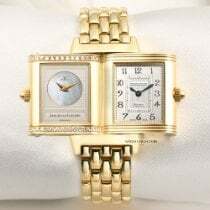 The Reverso is the most famous and successful wristwatch from the Swiss luxury watch manufacturer Jaeger-LeCoultre. This classic, rectangular watch with a reversible case is also available with a perpetual calendar, sidereal time, and a tourbillon. 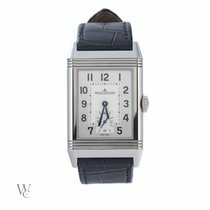 When you think of Jaeger-LeCoultre, the Reverso undoubtedly comes to mind. Developed in the 1930s for polo players, the rectangular timepiece is Jaeger-LeCoultre's most iconic model. At the time, polo players were complaining that their watch glass would often break during matches, so Jaeger-LeCoultre developed a timepiece with a reversible case to protect the delicate dial. Over time, the timepiece has developed into a status symbol and icon; kings and celebrities are among those who've worn a Reverso. The Reverso has also made it to the big screen, appearing on the wrist of Bruce Wayne, also known as Batman, in The Dark Knight Rises (2012). While the series once exclusively featured simple timepieces, it now includes versions with intricate complications such as a tourbillon or minute repeater. The Jaeger-LeCoultre Grande Complication à Triptyque, featuring a perpetual calendar, tourbillon, and sidereal time, is a prime example of haute horlogerie. The white gold timepiece costs around 340,000 euros. 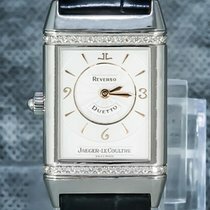 How much does a Jaeger-LeCoultre Reverso cost? The Reverso is available in a number of versions for both men and women, ranging from simple, classic models with two or three hands to Duoface or Duetto versions with displays on both faces, to intricate watches with complications such as a tourbillon or a minute repeater. Somewhat cheaper, precise quartz versions are also available. You can select a stainless steel, pink gold, white gold, or platinum case and pair it with an ostrich, calfskin, or alligator leather strap. The retro Grande Reverso Ultra Thin 1931, which Jaeger-LeCoultre introduced in 2011 in celebration of the timepiece's 80th anniversary, comes closest to the original 1930s model. Although the Reverso was originally designed for polo players, this 7-mm thin timepiece has become the perfect dress watch. Jaeger-LeCoultre was able to create such a thin watch thanks to their small, manual, in-house 822 movement. The dial is clean and simple with thin indices and no seconds hand. The 2011 model is available in stainless steel or 18-karat pink gold. Three horizontal grooves at the bottom of the reversible case give it an elegant look and emphasize the timepiece's Art Deco influences. The Grande Reverso Ultra Thin 1931 is now also available with a small seconds at six o'clock. You can purchase pre-owned models in very good condition starting around 6,000 euros, while new white or pink gold models with a small seconds cost around 11,000 euros. The Reverso Classic timepieces, which are available in different sizes and with a quartz, manual, or automatic caliber, are somewhat more affordable than these special retro models. The watches' simple design remains close to the original. New quartz models are available for around 3,400 euros, while their mechanical siblings are available for around 4,500 euros. The most intricate model in the Reverso collection is the Grande Complication à Triptyque. Triptyque is French for "triptych," a painting consisting of three panels. The Jaeger-LeCoultre Grande Complication à Triptyque has three main functions: it displays the standard time as well as sidereal time and features a perpetual calendar. Sidereal time is based on the Earth's rate of rotation in relation to the fixed position of stars and deviates from standard time by about four minutes per day. The front side dial of this white gold Reverso displays the standard time and features a 24-hour display, tourbillon, and power reserve display for the calendar. A perpetual calendar, sky chart, and zodiac calendar, as well as displays for sidereal time, moon phases, and sunrise and sunset times, are all found on the reverse side. If this is the watch you've been dreaming of, you should be prepared to spend around 340,000 euros. Since the 1990s, Jaeger-LeCoultre has been producing Reverso models with complications such as a perpetual calendar, minute repeater, or tourbillon, as well as chronograph versions. Tourbillon timepieces are Jaeger-LeCoultre's specialty; in 2004, they captivated the watch world with their spherical tourbillon, the gyrotourbillon. Standard tourbillons have a balance rim, balance spring, and escapement placed together in a cage that makes one full rotation per minute. Abraham-Louis Breguet invented this mechanism in the early 19th century with the goal of compensating for pocket watch deviations caused by gravity. These deviations occurred because most men carried their pocket watches vertically in their vest pockets at the time. Jaeger-LeCoultre improved upon the tourbillon with their gyrotourbillon. The gyrotourbillon's cage is enclosed in a second cage, creating a three-dimensional rotating complication. The complex mechanism increases precision by compensating for positional deviations. Jaeger-LeCoultre has already released three generations of this unique mechanism. Reverso models with a gyrotourbillon are excellent examples of haute horologie. The cases are exclusively available in either gold or platinum. A new pink gold Reverso with a gyrotourbillon costs almost 250,000 euros; a platinum Reverso with a standard tourbillon is in the same price range. The Reverso Duoface, introduced in 1994, is intriguing for business people and frequent flyers. The front side dial displays the local time and the reverse side displays the time in another time zone. The case is available in stainless steel or yellow, white, or pink gold, and Arabic numerals serve as hour markers. The Tribute Duoface resembles the first models from the 1930s with its baton indices. Hand-wound, in-house movements power these timepieces. You can purchase a pre-owned stainless steel Duoface for around 5,700 euros; new, they cost around 6,500 euros. Pre-owned gold watches cost around 7,500 euros, and new versions cost significantly more at 15,500 euros and above. 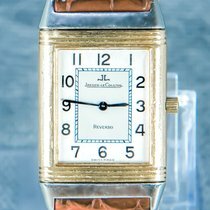 The idea for the Reverso was born in 1930, when British colonial officers stationed in India approached the Swiss businessman César de Trey with a request: a wristwatch that could withstand a polo game. The officers often complained of the watch glass in their timepieces breaking during matches. De Trey began working on their request and approached Jaeger-LeCoultre. In 1931, the timepiece was ready to be sold. It featured a case that was completely reversible, making it easy to protect the front side dial. The Reverso was introduced to the market that same year and became a hit. Its name comes from the Latin word meaning "to turn around."